A new Chinese skewer (BBQ) restaurant has opened in Chinatown that also does skewer hot pot. I don't remember seeing any skewer pot places in Chicago but I could be wrong. The first thing I noticed was the name - Friend BBQ. There is a place in Flushing I go to sometimes called Friendship Foods BBQ. One of my favorite things is their Xingjiang Special Lamb which comes on some larger tree branches/twigs instead of standard skewers. Xingjiang is a province in western China - largest city being Urumqi. This is fairly close to Kazakhstan and Kyrgyzstan and many Uyghurs are there. Not common food in the US at all. Friend BBQ has the same thing. Coincidence maybe, but their menus are VERY VERY similar. Very similar if even the Chicago one is a lighter menu of the one in Flushing. The skewer pot for the example not only has the same price, but also the same rules so to speak, and even the same exact things you get in it as the one in Flushing. 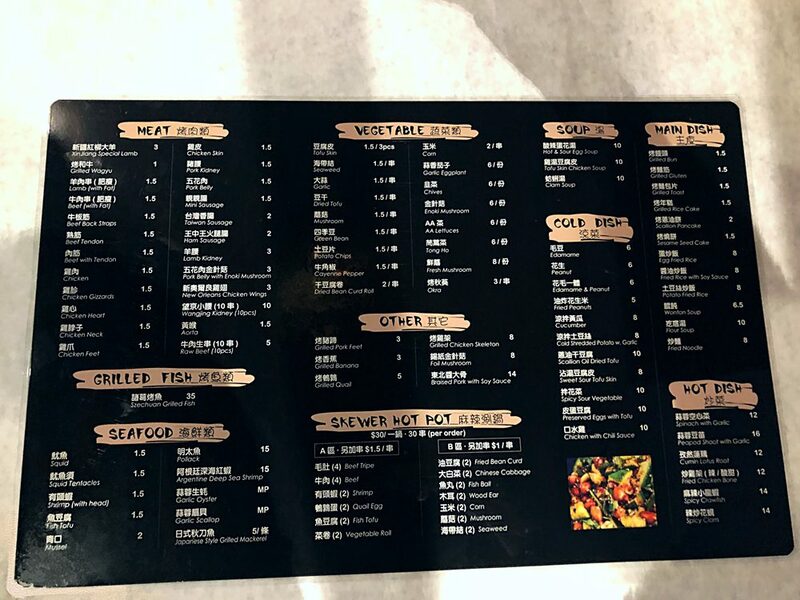 Design of the menu is similar. Either that or someone is copying the one in Flushing pretty well. I will have to check this out soon...another BBQ placed opened up nearby, off of Wentworth, called Gao's Kebabs I believe (or in Chinese, amusingly, Lao Gao Shao Kao). I haven't seen proper Ma La Tang on skewers yet, but I thought the place in the Richland food court would let you pick stuff to add, and then basically hot-pot it for you, which is a similar idea if not grab-and-go exactly. Lamb skewers are among my favorite foods from China, and since the BBQ spot in the food court closed up, nothing else has scratched the itch, mostly for lack of charcoal. Hoping one of these two places takes care of that. mtgl wrote: Lamb skewers are among my favorite foods from China, and since the BBQ spot in the food court closed up, nothing else has scratched the itch, mostly for lack of charcoal. Hoping one of these two places takes care of that. My fiancee thought that the skewers at Homestyle Taste in Bridgeport were very good. If this Friend BBQ is basically the same as the Friendship Foods BBQ in Flushing, then you should try the Xinjiang Lamb skewer - good stuff. I went to eat at Friendship BBQ in Flushing tonight. My fiancee asked and they said yes, Friend BBQ in Chicago is also theirs. If it's anything like the one in Flushing in terms of flavor and you like Chinese BBQ skewers, then I recommend it. Mazel Tov! How very 2019 of you. Seriously, thanks for the intel. Went today...Friend is very very tasty, but also pretty pricey. We spent almost sixty dollars for two people before tip. That said, we were pleased with the product, which brought me back to my time in China. We had the big Xinjiang lamb skewers, beef and chicken as well, and then pork belly and chicken skin. We also got green beans and okra, plus a grilled eggplant and cucumber salad. Both of these latter dishes were absolutely tops, popping with flavor. The kebabs were tasty, with the same uniform seasoning on them all, of course. I'm pretty sure there is charcoal in the kitchen, which makes all the difference. Afterwards we took a spin by Gao's Kabobs which was even more crowded, with a very similar menu and better prices, so we'll be hitting that up soon to compare. LOL thanks for the laugh. mtgl wrote: Went today...Friend is very very tasty, but also pretty pricey. We spent almost sixty dollars for two people before tip. That said, we were pleased with the product, which brought me back to my time in China. Yeah, I wouldn't say it's cheap though not expensive. Then again, maybe I'm just used to NYC prices. I've never had Gao's, but would be interesting to try. This type of cuisine is popular in China where my fiancee is from (Liaoning province - Dongbei) and I believe the owners are from there too. I'm probably wrong, but my understanding of why this type of food is there when it originated all the way in Xinjiang (Western China where Uyghurs are) is interesting. My fiancee in part is from a minority group called Sibe (aka Xibe or Xibo - I think Siberia is named after them) and it's truly minority with under 175K people in the entire country part of the group. They originated in NE China, but there's a bunch of Xinjiang now. My understanding is that they've been contracted militarily numerous times throughout the last handful hundreds of years - and have been contracted a few hundred years ago in Xinjiang. I believe they went there and might have brought back the whole skewered meat thing. Could be completely wrong though.. Anyway, we like Friendship BBQ and there's almost always a wait for a table during the evenings. Curious if the same thing will happen in Chicago eventually. They are better than average for the US for sure, but my fiancee keeps telling me that the lamb skewers at Homestyle Taste in Bridgeport are the best or among the best she's ever had anywhere in the US. They are also as we know from the same region. Haven't hit up Gao's Kabobs yet, perhaps tonight, and will report back. I think Friends was better than Homestyles because of the almost-certain presence of charcoal, which I don't think they use at Homestyle (and which they definitely used at Lao Pi in the basement food court). That said, this was a food I ate every day in Beijing when I studied there, and it was nearly always street food, with just a few options--lamb and chicken wings were the most beloved and most common. It was not always cooked by Uyghurs from Xinjiang, however, as it is ubiquitous across the whole country. I think it's more common up north, but the biggest push factor is probably the lamb-loving Mongols nearby, and the fact that lamb is a "hot" food which is good for the body in winter. mtgl wrote: Haven't hit up Gao's Kabobs yet, perhaps tonight, and will report back. Yes. My point was that it originated in Xinjiang and was popularized elsewhere - pretty much everywhere now after (which today is still a long time ago I think). I'm going off of the history my fiancee told me, but the Sibe people from NE China (Jilin and Liaoning) which she is part of were garrisoned in Xinjiang militarily to help out with something (1700s I think?). I believe it was after that which skewers found their way out to Eastern China. They are everywhere now though, yes. My fiancee did undergrad in Beijing and took me to a really awesome skewer place there. It's definitely street food though - there's actually a few carts in Flushing which do it on the street. Good stuff. Hopefully Chicago continues to get more legit Chinese food as it has been. Would be amazing to see some street food in Chinatown. Not sure of the legality since it's such a weird thing in Chicago but would be great to see. Based on this writeup I planned a group dinner at Gao's. I don't recall why I chose Gao's over Friend. Trays of boiled peanuts and edamame are on the tables when we sat down. Meat skewers were quite tasty, Beef, Lamb, Pork, Sausage, Gizzard, Chicken Heart. The gizzard and chicken hearts suffered from overcooking. Being a carnivore, grilled meat usually outshines any veggie offering but at Gao's, the roasted eggplant dish and then the chive stalks were outstanding. Eggplant was quite possibly one of the best eggplant dishes I've had in years. The greenbeans on the table next to our group looked quite appetizing, a for sure order next time. Side note: our group dined at 6:30pm on a Monday night, restaurant was certainly busy. By the time we departed at 7:45pm, there were plenty of open tables. at his blog, Da Beef wrote: Gao's is tucked away on 22nd street. Thus it hasn't really taken off with the Anglo's. That said the younger locals have been all in since it's opening. Which had prevented me from trying it until a few weeks ago when we noticed they were almost empty. Well within a half hour of being seated the place was packed with large groups dining on large trays of kabobs. The menu is a full page front and back. It's broken down by kabobs and also some non-kabob menu items. On my first visit they were out of just about all the non kabob menu items. Bummer but as I later learned on more recent visits the kabobs are what you're there for. At least they're what everyone else is there for. Of late they've been giving tables edamame and boiled peanuts with hints of star anise in each bite, a delight.